also for cleaning wax and oil paint mixture from brushes and equipment. Use as diluent and solvent for Cold Wax and oil/wax mixtures. 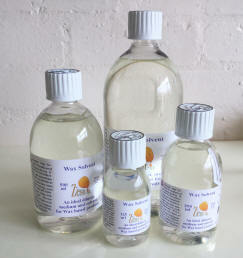 The Zest-it Wax Solvent is a non-toxic, non flammable fluid with a slight yellow colour. It has a mild orange smell from the Citrus Oil, it has low VOC's, which means little is lost to the atmosphere and your workspace. It does not mix with water. It can travel by road, sea and air, which makes it an excellent accompaniment if you are going on a painting holiday (depending on the airline). It is re-usable, which makes it economical and a little goes a long way. It is ideal for thinning Wax and Oil paint mixtures to change the handling qualities and for making glazes and drizzles. Use to clean brushes, painting knives, rollers, wedges, shapers and even surface mistakes from the canvas. Have 'safety sense' when using any solvent. Use in a ventilated area, away from sparks and flames, do not heat the product. Keep away from children, do not eat, drink or smoke when using the product (no water bottles in the same area!). Sizes available - 125 ml; 250 ml; 500 ml; 1 Litre.